Operational issues are critical to the development of a truly global counter-ecrime effort. The sixth annual Counter eCrime Operations Summit (CeCOS VI) will convene in Prague, Czech Republic, April 25-27, 2012, as the APWG gathers global leaders from the financial services, technology, government, law enforcement, communications sectors and research centers to define common goals and harmonize resources to strengthen the global counter-cybercrime effort. This year's Summit will focus on the shifting nature of cybercrime and the attendant challenges of managing cybercrime's dynamic threats landscape. 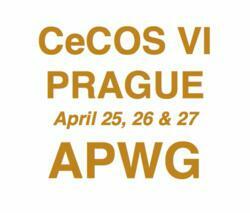 CeCOS VI Prague will review the development of response paradigms and resources available to counter-cybercrime managers and forensic professionals in the private and public sectors from around the world. Specific goals of this high-level, multi-national conference are to identify common forensic needs, in terms the data, tools, and communications protocols that are required to inform and facilitate time-sensitive communications between counter-ecrime stakeholders around the world and to harmonize objectives shared by private sector industrial sector responders and public sector policy professionals. “Operational issues are critical to the development of a truly global counter-ecrime effort,” said APWG Secretary General Peter Cassidy, “CeCOS VI makes those operational issues the central focus of the program for the benefit of all ecrime fighters.” To achieve its goal, CeCOS VI will detail the eCrime landscape and present proposals for coordinating global responses that will harmonize efforts of eCrime respondents and organize the work of securing the global network infrastructure. Presenters will examine the development ecrime data exchange specification and how new protocols can be employed to optimize counter-ecrime applications. Additionally, presentations about industrial policy at CeCOS VI will investigate policies that complicate the work of exploited brand holders and responders - such as the segments of domain name system (DNS) registration process that is abused by phishers as part of their phishing campaigns. Presenters will also review case studies of national and regional economies under cybercrime attack, narratives of successful trans-national forensic cooperation; consider models for cooperation against ecrime and examine resources for cybercrime response; and forensic enterprises. At previous CeCOS conferences in San Francisco, Tokyo, Barcelona, Sao Paulo, and Kuala Lumpur,the APWG has drawn hundreds of delegates from law enforcement agencies, technology companies, financial services firms, security services firms, government agencies, law firms, consumer advocacy groups, and research centers from around the globe, bringing together some of the most advanced counter-electronic crime thought leaders from East Asia, South Asia, Europe, South America and North America.